UNLESS you’ve been living under a rock for the past year, then you will know that 2016 has been pretty big. David Bowie and Prince have sadly passed away, the UK voted to leave the European Union, and of course, there was the small matter of building information modelling (BIM) Level 2 becoming mandatory for all UK public sector projects. But did you know that Germany have also been putting plans in place? To mandate BIM that is, not leave the EU. It was announced in late 2015 that BIM will be mandatory on all German transportation projects by 2020, that’s according to the German Government’s Minister for Transport and Digital Infrastructure, Alexander Dobrindt. However it was this year that work really got juicy on the ‘poster boy’ for Germany’s infrastructure BIM prowess; Rastatt Tunnel. Train operator Deutsche Bahn is the Client and have appointed engineering powerhouse Arup to assist in the new development. HOCHTIEF ViCon and Zublin will handle the construction works having been awarded the €312 million contract. Ilka May, an Associate Director at the aforementioned Arup, believes Germany is creating “clarity of future requirements”. Time to prove the sceptics wrong Germany! So just what is Tunnel Rastatt? A video released by Bahnprojekt Karlsruhe-Basel showcases the impressive amount of work that will be undertaken. There are in fact two 4,270m tunnels being constructed; the nucleus of a 17-kilometre-long line, connecting Ötigheim with Niederbühl in the Rastatt district. Boring is taking place 20 metres underground and runs under the River Murg to reduce the development’s environmental impact. In total, 700,000 cubic metres of material will be excavated by two boring machines; each 11 metres in diameter and 85 metres in length. The tunnel hollowing began in spring 2016 and will complete in Autumn 2017. 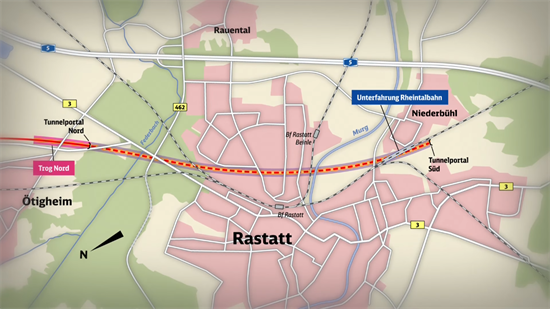 The tunnels will be occupied by two new tracks (one in each), designed to alleviate congestion on the current two-track Karlsruhe-Basel high speed line, providing more options for long distance passengers. High speed journeys will be reduced by 30 minutes once this addition to the corridor has been completed in 2022. It is predicted that German businesses could increase project efficiencies by up to 30% with correct and knowledgeable BIM implementation. We’ll see how Deutsche Bahn get on with Rastatt Tunnel, but we don’t think the industry has anything to worry about. Germany have been thrown into the deep end by having such a large-scale project act as a trial run, but we’re sure that Alexander Dobrindt will be swimming just fine after all is said and done. After all, building information modelling is a good metaphorical set of armbands.